- 🎅 MULTIFUCTION, EXCELLENT EFFECT - Our Christmas projector lights & water wave light is equipped with 2 heads, 12 slides patterns and RGBW water-wave ripple effect. Remote control to choose multi colors for you to create perfect party light and atmosphere. 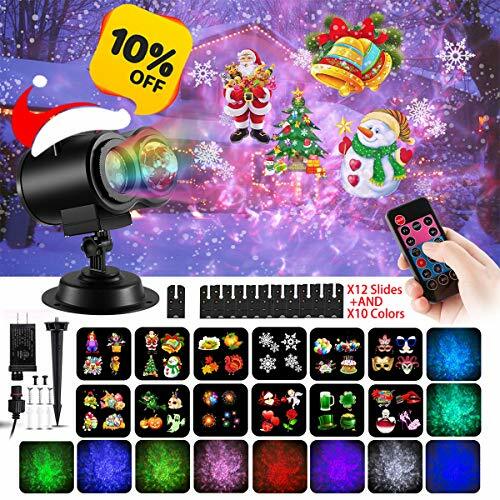 - 🎅 WIDE APPLICATION - 12 various colors and changeable slides, which make the Christmas projector lights & water wave light widely use, suitable for Christmas, Halloween, holiday parties, birthday, yard garden decoration, and daily use for kids’ bedroom. - 🎅 EASY TO USE - This light projector will come with a remote controller, which makes the operation easier. You can set time as per your diverse needs (2 hrs,4 hrs,6 hrs for option) by the built-in timer, and controls the speed of the motion party light/ the colors/ the color cycles by the buttons on the controller etc. It surely will be your perfect party light for your night.